Promised some co-workers I would take them out on a trip. Actually tried 2 weeks ago on a Friday night but weather was really bad and had to cancel at the last minute..
Got out around 7:30 PM or so and started to gear up. I stayed off of the flats for an hour or so until there was more water up there. Then about an hour before high tide we headed up. Fished with only a couple of bites (questionable though). Then we began to see and hear others around us catching them. I don’t like crowds though so we moved away. Each time I did though, I swear everyone followed me like I was on fish. Still seeing people catch fish I was getting a little confused. We tossed an eel out for good measure and after a lot of time in the water the line went off. But by the time I picked it up it was gone (eel too). Too much work for me with 3 people in the boat though so have to think that over a little better in the future. Then some line got caught in my prop and in the process one of my co-workers (Justin) yells out loud, “I got one, I got one.” I said, hey don’t do that. He said “what?” I said, look around us now. As we looked up boats started motoring over to us like zombies in the dark. Justin fought the fish for a little while then I helped him land it. A respectable 34″ 13 pound solid striper. Nice! After freeing the line from the prop, I quickly switched my weightless sluggo to one on a jighead (similar to what I setup for Justin). Lathered up my bait with smelly jelly then probably 3 casts back I got whacked. At 1st I though it got off. Then nope, it is on. Then…. wow, this is a good fish. Whoops, it is gone. Nope swimming right at me. Around the boat / back to the front / taking lots of line. Finally got it tired out and with one hand on the rod and the other over the bow I lipped this toad of a striper. 21+ pounds and 38 fat inches. Wow, that was awesome. That is exactly why I fish. For that adreninline rush you get when hooking into, reeling in, and landing a fish like that. As the night went on, there were still some more yahoos calling out kudos on big fish being caught, some good splashes, and the entertainment of the googans that should have been on the shore getting drunk but instead took the boats out. 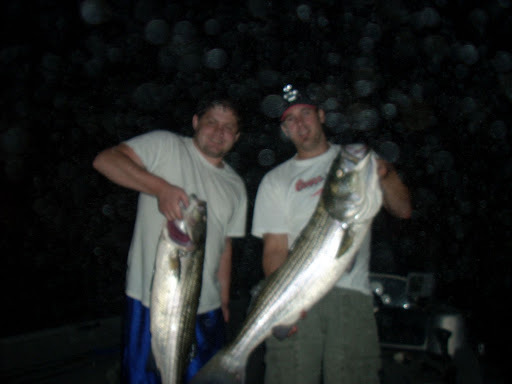 Justin got his 1st striper that night and I was pshyced for him. Ken did not and I felt bad. But he has probably more gear than me and lives close to the salt so it is only a matter of time. Until then he wants to be called pepe le pu. Finally got the kayak out into the salt. Launched from water street and paddled along the Beverly shoreline up to Manchester. Did not get all the way to Manchester I don’t think but was fairly close to Misery Island. Sky was getting dark and the last place I wanted to be was caught out there during a storm. Headed back in towards salem then up to Danvers where my wife would later pick me up at the Rt 35 bridge. 12 miles of trolling a tube and worm and only two bites (if they even were). I also chucked a sluggo around but no takers. Just as I put the kayak on the roof of the truck it started to rain out pretty bad and thunderstorm rolled in. Talked to someone on the phone not long after that and they went to Marblehead and had a great day catching schoolies. Oh well, you live and learn. Was still cool to get the kayak on the saltwater for the 1st time. Man that thing is stable. Hit the big lake today (the Atlantic ocean) for some bait fishing. Hearing reports of good mackerel around I wanted to try it. We found the macs right away and proceeded to fill the livewells with them. Probably got around 70-80 all on sabaki rigs. Pitched live ones to the rocks and trolled with them without a single bite. Went all the way up into the river area twice and our second trip all the way to the 95 bridge. Nothing. Later that day while jigging the bottom hoping to catch a flounder, I hooked into a fish I had never caught or seen before. It was a Sea Robing. What and odd looking fish but neat. Wanted to take a picture but while I had it along side the boat, I was confused at how to land it and lost it. Oh well. Day without fish.